This Byelaw applies in the ‘inherited area’, which is described below, only. 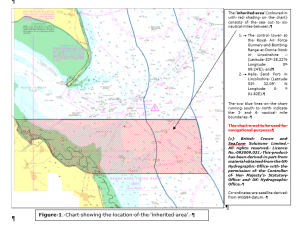 This Byelaw applies to that part of the District within the River Humber upstream of a straight line drawn between Spurn Head Lighthouse (position Lat. 53o 34.49’N. Long 000o 06.65’E) and RAF Donna Nook Control Tower (the control Tower at RAF Air Gunnery and Bombing Range at Donna Nook), (position Lat. 53o 28.50’N. Long 000o 09.22’E). 1.2 The prescribed application form has been accurately completed and received (the proof of which shall be upon the applicant). Such permits are not transferable and can only be relied upon by the person named in the permit and whose photograph is attached to the permit. The Committee retains the right to refuse to issue a permit until such time as any applicant makes available any outstanding accurate information required for the issue of that permit, or outstanding information required by section 4 of this Byelaw. Any person fishing for cockles and being the holder of a permit shall, by no later than the 5th day of each month, make a full and true return in a form specified by the Committee, of the date upon which and the location from which any cockles were taken in the previous month, together with quantities (in kilograms) of all such cockles taken, or if appropriate, a statement that the person had taken no such cockles. Any person who takes or removes from the fishery, less than five kilograms of cockles per day, shall not require a permit. No person shall remove from the fishery any cockle between the 1st of May and the 31st August inclusive. No person shall use for the purpose of taking cockles any instrument other than a rake or other like instrument with a head width not exceeding 305 mm and having spaces of not less than 20 mm between the teeth. No person shall remove from the fishery any cockle which will pass through a gauge having a square aperture of 20 mm measured over each side of the square, except in accordance with the prior written authority of the Clerk. No person shall remove more than 500 kilograms of cockles in any twenty- four hour period, except in accordance with the prior written authority of the Clerk. It shall close for a specified period any cockle bed or part of a bed. 10.1 No person shall, without the prior written authority of the Clerk of the Committee fish for, remove, take or disturb any cockle from a bed or part of a bed that has been closed under this byelaw. 10.2 Where any bed or part of a bed is closed under this Byelaw, the Committee will, where it is practicable to do so, cause notices to be displayed in the vicinity of a bed or part thereof clearly defining the area in which the cockles shall not be removed, taken or disturbed without the prior consent of the Committee. In addition, notice will be given by publishing the same in a newspaper circulating in the District in which the cockle bed is situated.